This is the second of three posts dedicated to the Second Annual Barrymore Blogathon being held over at In The Good Old Days of Hollywood. Tnx Crystal for letting me take part! Brief Synopsis – Two rebellious teenagers fall in love and want to run away together. My Take on it – For this year’s choices for the Barrymore Blogathon, I decided to go with movies featuring one of the youngest of the family, Drew. We all have been enamored by her ever since she showed up in E.T. (1982) and her resume is quite long. For this blogathon, I chose to review three of her films from 3 different parts of her life; her child years, her teenage/twenty-ish years and her more adult years. 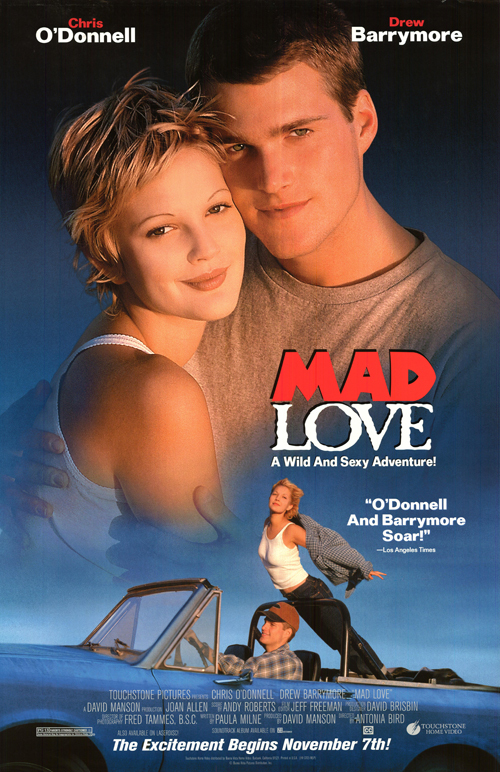 This time, I chose to review a teen coming of age romance starring Drew and Chris O’Donnell. Unfortunately, the two of them have no chemistry whatsoever here and it’s painful watching them try. The plot of the movie doesn’t stay anchored in any way, shape or form and ventures off on lots of strange tangents that make little sense of the whole thing. All of the characters feel like archetypes that have appeared in thousands of other films and they lack any originality at all. It’s pretty easy to almost predict what every one of them will do or say because they all just go through the regular movie character motions here. Even Kevin Dunn, Jude Ciccolella and Joan Allen who are usually great in the movies they are in couldn’t help make this film any more watchable. In a nutshell, this is a pretty lame attempt at a teen romance film and there are many more that do it so much better. Bottom Line – O’Donnell and Barrymore have no chemistry together whatsoever. The plot goes off on too many tangents and doesn’t stay focused like it should. The characters are all archetypes and its all too easy to predict what most of them will do. Basically a pretty lame teen romance. Pingback: THE SECOND ANNUAL BARRYMORE TRILOGY BLOGATHON HAS NOW ARRIVED – In The Good Old Days Of Classic Hollywood.